This is one of the nicest and most readable books I've come across in a long while. Enchanting and captivating Irish writer Nuala O'Faolain takes us on a follow-up journey since her first memoir, Are You Somebody?, which came out in 1999. From her homes in Ireland and America, we get to catch up on this interesting woman's life, now in her sixties, never married and childless, a little of her childhood, and how she feels about life and love now. I haven't read her first book (or her novel My Dream of You, but I've just taken it out of my library) and I can't wait to learn more about this compelling newspaper columnist. We share many similarities, she and I, and I fully understand where she's coming from in most regards. 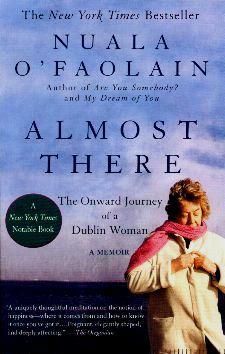 I enjoyed her candidness about the child of her American friend as well as her take on relationships in general. One can never really fully comprehend the extent of one such person's upbringing (alcoholic mother) unless you've been there yourself, but, she makes it so much easier to see the other side and for us to try and be a bit more understanding and compassionate. Conclusion - Thoroughly enjoyable and I didn't want it to end.